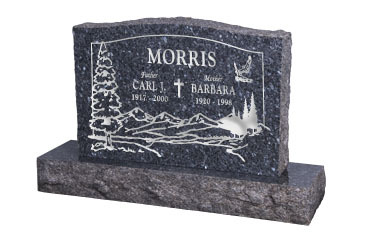 This upright is polished on both the front and back sides to allow for engraving. The serpentine top stands 24" tall and rests on a 6" base. 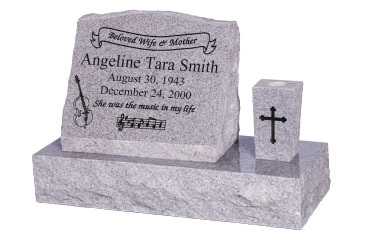 This upright is polished on both the front and back sides to allow for engraving. 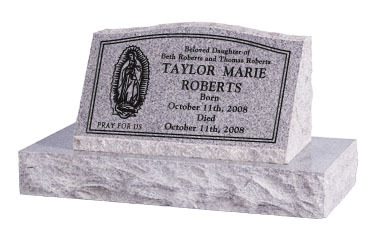 The serpentine top stands 24" tall and rests on a 6" base. 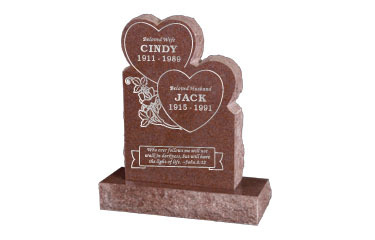 Includes a 9" flower vase that can be engraved on both sides. 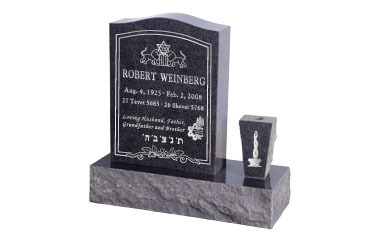 This upright is polished on both the front and back sides to allow for engraving. 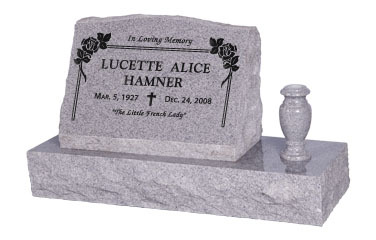 The serpentine top stands 24" tall and rests on a 6" base. 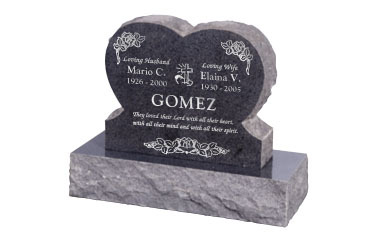 Includes two 9" flower vases that can be engraved on front and back sides. 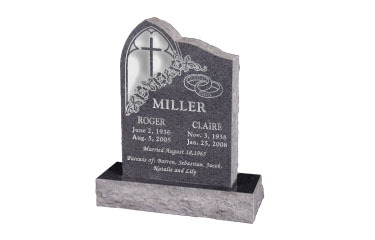 This slant is polished on both the front and back sides to allow for engraving. The serpentine top stands 16" tall and rests on a 6" base. 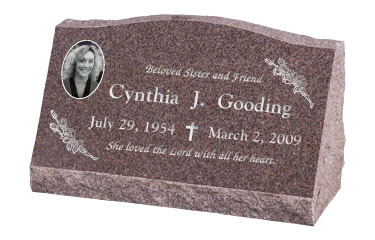 This Flat Headstone is polished on top and can be custom engraved with your choice of designs and wording. 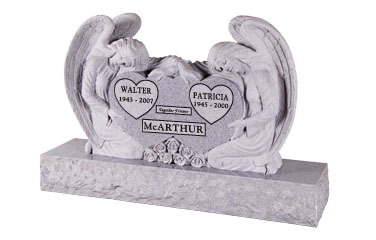 This upright is in the shape of two hearts that are connected forever. The front and back sides are polished to allow for complete custom carving. The base is 34" wide. This upright is in the shape of a large cross. The front and back sides are polished to allow for complete custom carving. The base is 34" wide. 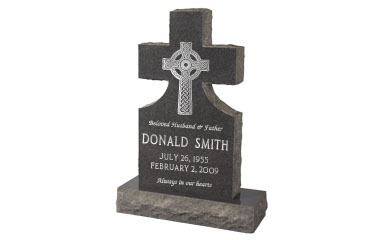 This upright has a gothic style arch with cross. The front and back sides are polished to allow for complete custom carving. The base is 34" wide.. 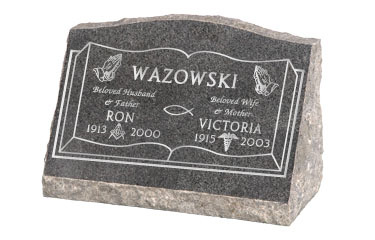 This upright is uniquely shaped and can be engrave all the way around. The monument comes all polished. 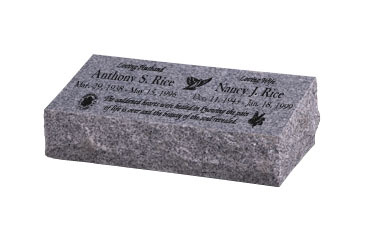 The Base is 48" wide and has a 2" Polished Margin. 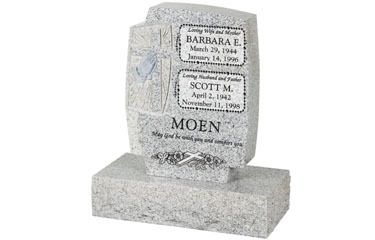 The monument comes all polished and the Base is 48" wide. 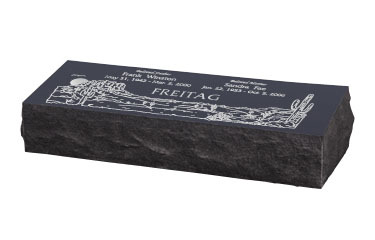 includes a 2" Polished Margin. This upright has a carved statue of St. Mary on the side. 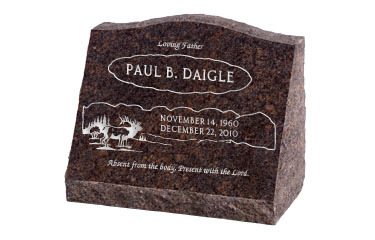 It is all polished to allow for complete custom carving. 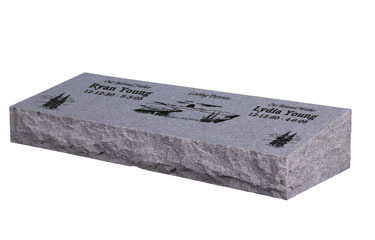 The base is 34" wide. This upright has an olive tree carved into its side. 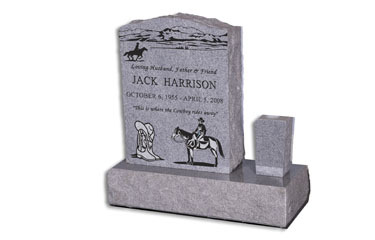 It is all polished to allow for complete custom carving. The base is 34" wide. This upright roses carved into its side. 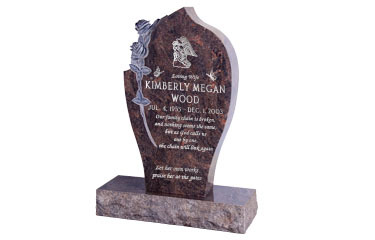 It is all polished to allow for complete custom carving. The base is 34" wide. This upright is in the shape of one large heart. The front and back sides are polished to allow for complete custom carving. The base is 30" wide. 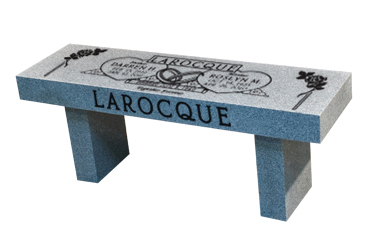 This Curved Leg Bench can be personalized with lettering and design. 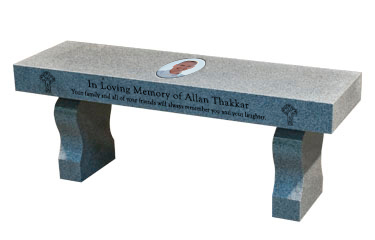 The Seat is 48"x14"x4". 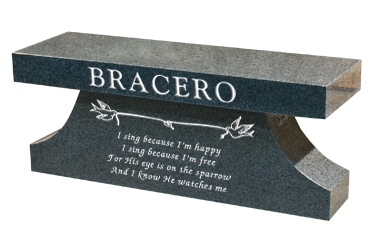 The Legs are 10"x4"x14"
The Cremation Bench can be personalized with lettering and design. 3 Core Holes are included. The seat is 44"x14"x4". 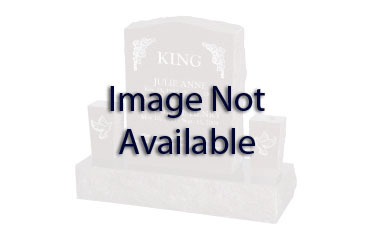 The Support Base is 36"x8"x14". 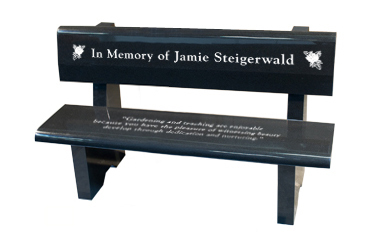 This Memorial Park Bench can be personalized with lettering and design. 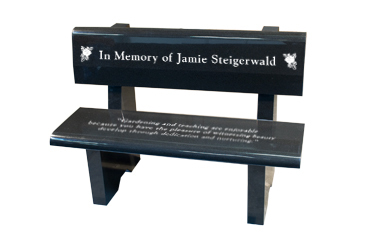 This beautiful Memorial Park Bench can be personalized with lettering and design. 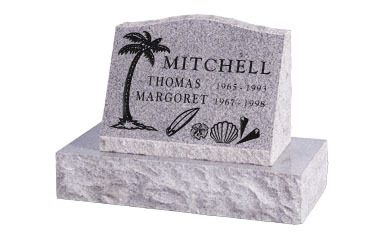 The overall measurements are 48" wide x 20" deep x 33" tall. 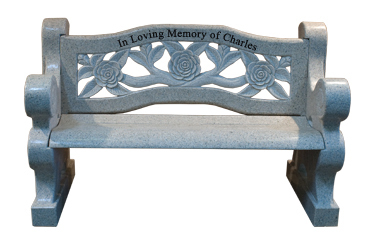 This Beautiful Carved Rose Bench can be personalized with lettering and design. 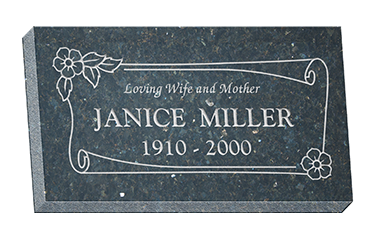 The overall measurements are 59" wide x 26" deep x 36" tall. 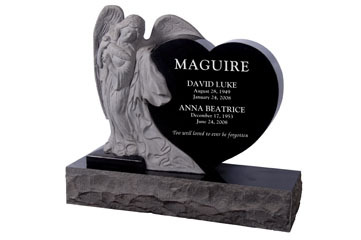 Order your beautiful powder coated aluminum cremation urn designed to last. 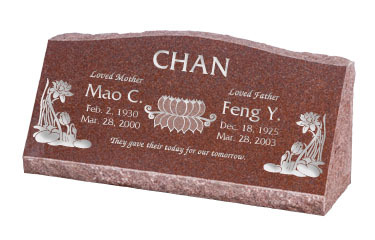 Each urn is made in the United States. 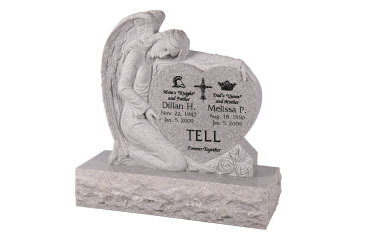 The front of the urn is custom engraved with the information that you choose. 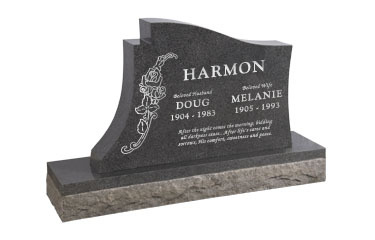 The price includes lettering and graphics from our artwork gallery. 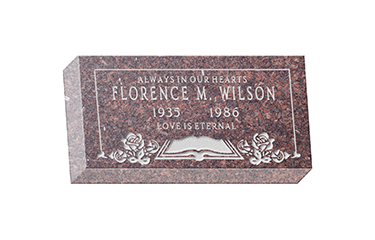 The engravable surface is 4" W x 6" T. The inside of the urn is a standard 200 cubic inches and is accessible from the bottom of the urn. 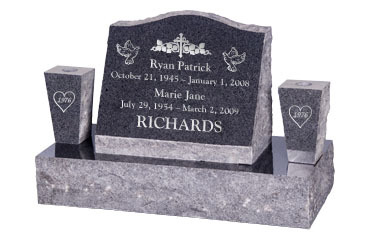 Order your beautiful powder coated aluminum cremation urn designed to last. 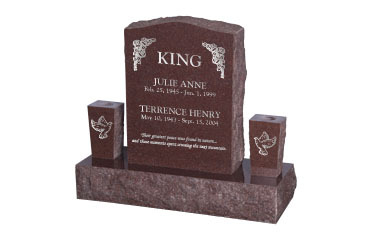 Each urn is made in the United States. 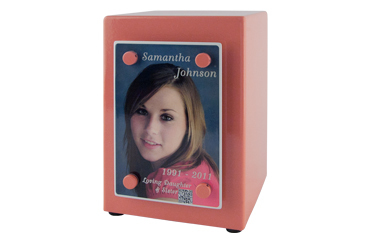 The front of the urn is custom engraved with a picture you provice and text. 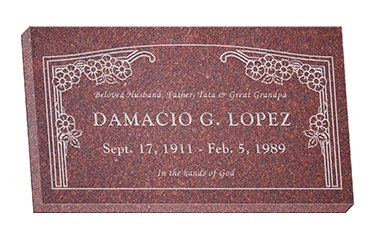 The price includes lettering and graphics from our artwork gallery. 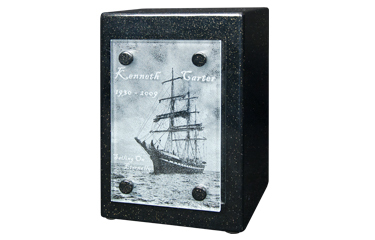 To show off the picture the best, our engraved photos are only available on a Black Gold urn. 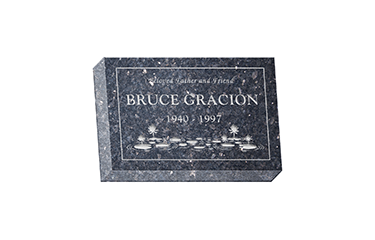 The engravable surface is 4" W x 6" T. The inside of the urn is a standard 200 cubic inches and is accessible from the bottom of the urn. 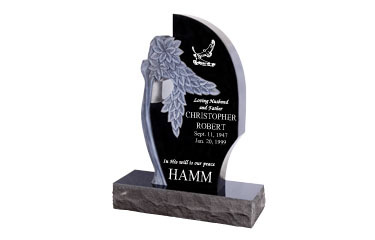 Order your beautiful powder coated aluminum cremation urn designed to last. 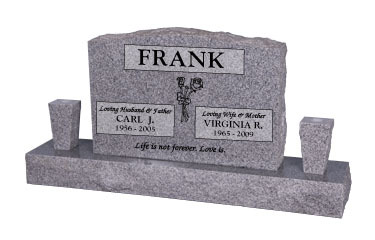 Each urn is made in the United States. 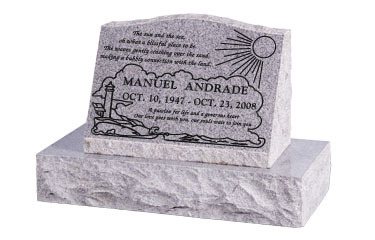 The front of the urn is a custom ceramic photo with the text of your choice. 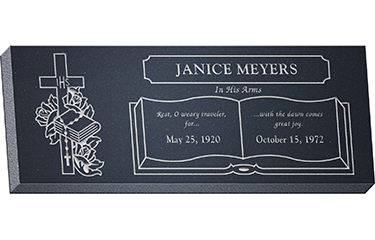 The price includes lettering and graphics from our artwork gallery. 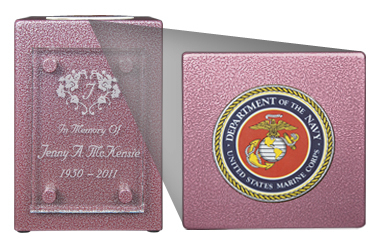 The customizable surface is 4" W x 6" T. The inside of the urn is a standard 200 cubic inches and is accessible from the bottom of the urn. 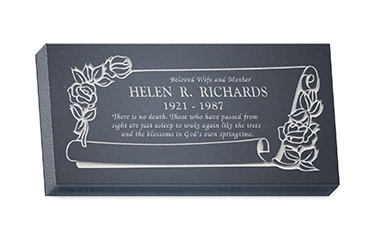 Order your beautiful powder coated aluminum cremation urn designed to last. 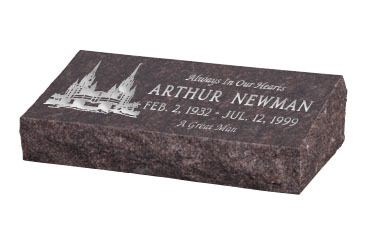 Each urn is made in the United States. 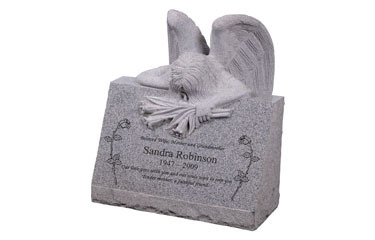 The front of the urn is custom engraved with the information that you choose. 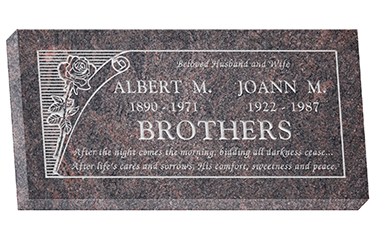 The price includes lettering and graphics from our artwork gallery as well as a 3.5" round ceramic photo affixed to the top of the urn. 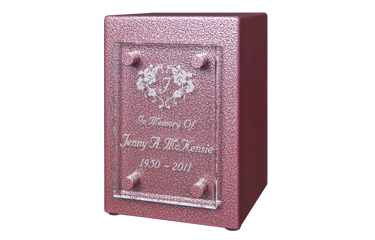 The engravable surface is 4" W x 6" T. The inside of the urn is a standard 200 cubic inches and is accessible from the bottom of the urn. 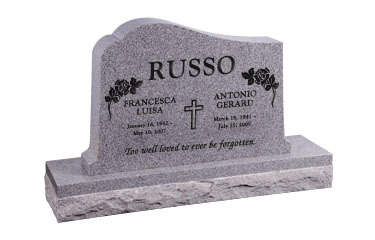 Order your beautiful powder coated aluminum cremation urn designed to last. 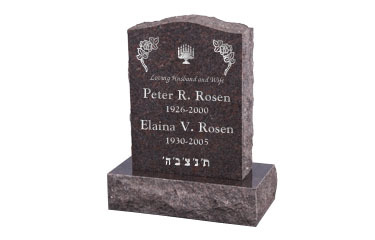 Each urn is made in the United States. 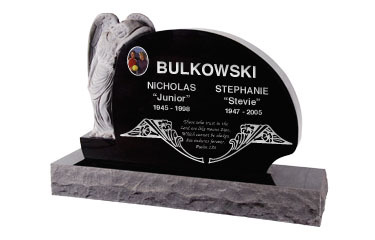 The front of the urn is a custom ceramic photo with the text of your choice. 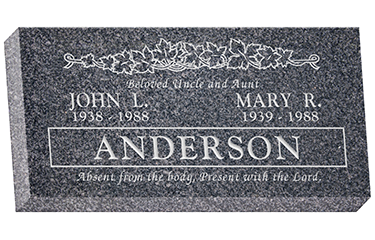 The price includes lettering and graphics from our artwork gallery as well as a 3.5" round ceramic photo affixed to the top of the urn. 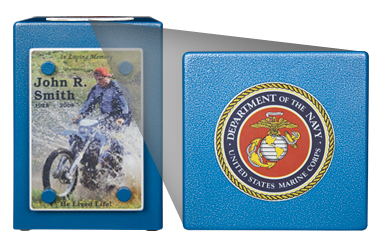 The customizable surface is 4" W x 6" T. The inside of the urn is a standard 200 cubic inches and is accessible from the bottom of the urn.